This past weekend was a big one for the museums of Denver, there was Night at the Museums event that happened Saturday, + the Kirkland Museum's Studio was on the move to its new location in the Golden Triangle on Sunday. In light of all this I thought it would be fitting to talk about one of my favorite museums in Denver the Clyfford Still Museum. Yes the architecture is everything I love, minimalist, + raw materials at its finest. I could go on and on but that’s for another post at another time. Today's post is all about how the materials of the interior juxtaposes with the bright colors of Still's artwork. You have a group of tightly placed artwork on stark white walls allowing the colors of the paintings to tell the story + collaborating with each other to make one single piece. The exposed concrete walls add to the paintings, their texture makes them an extension of the piece itself as if they were talking to one another. The only wall that is painted a deep purple is the wall where a self-portrait of Still himself is displayed making it a wall not to miss. The glass railings + open walls into the next galleries allow all the artwork to speak to one another, cohesively making it really just one gallery. The current exhibit is Still's works on paper + the different mediums he used to create them + let's not forget even the most sought after artists uses Crayola Crayons from time to time. 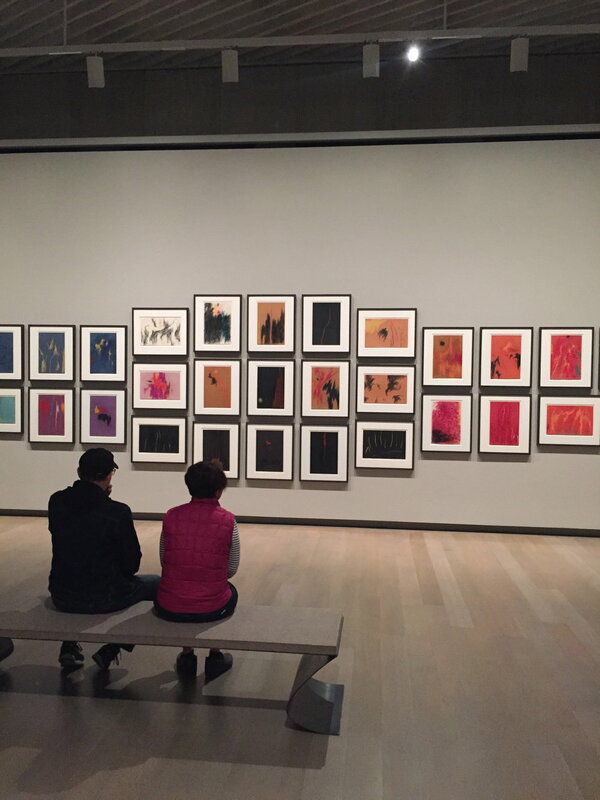 If you want to see a great example of art living in harmony with its museum, I highly encourage everyone to take an afternoon + visit the Clyfford Still Museum in Denver’s Golden Triangle Neighborhood.